My Reyna is done and here she is in all her glory! I knit this project in basically a week or 7 days of active knitting. It FLEW off my needles and I just don’t understand/comprehend how obsessed with this project I was. 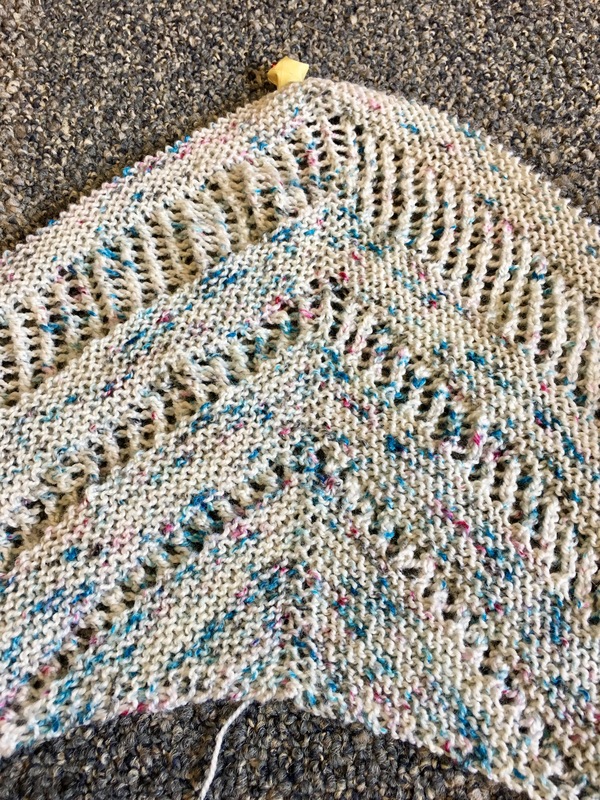 I was feeling so proud that I hadn’t made any mistakes during the knitting….and then hubris got me. I was on the second-to-last eyelet row and my eyelets got out of alignment. I had missed one teensy tiny stitch. So I carefully tinked back half a row and fixed it (took me 30 minutes). I then proceeded to re-knit that row and then almost the whole last row of eyelets and that knitter niggling started in my brain. 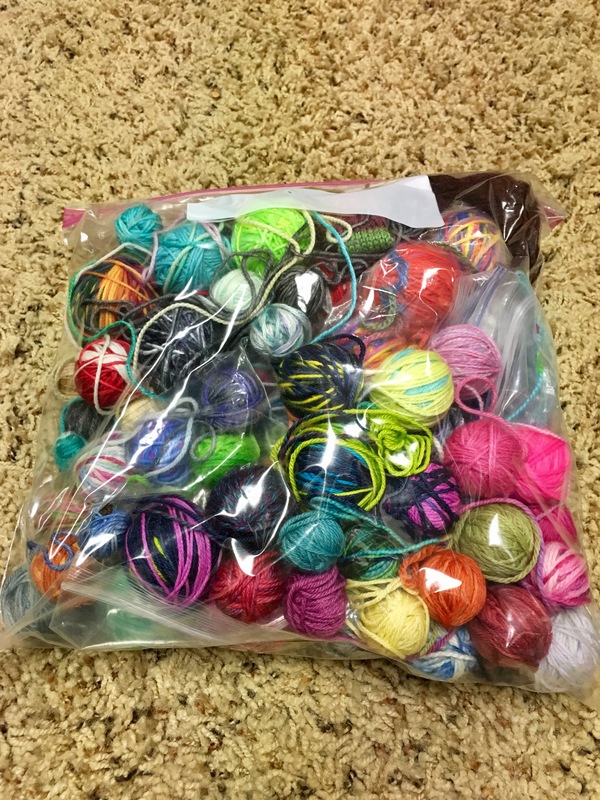 I was definitely not going to have enough yarn. So I tinked back two and a half LONG rows to where I would omit the last RS and WS eyelet rows and the started the garter. I was basically back to where I had tinked back to the first time and this took me an hour. But I managed to finish the garter and bind off with just a small nugget of yarn to tuck into my memory blanket! I washed and blocked this in just under two hours thanks to the late September Kansas heatwave and my husband’s fan. I don’t have blocking wires and you can see where I placed my pins. But I don’t care…it’s all mine now! I cannot wait for fall to when I can wear this beauty out and about! This project really has kicked my knitting mojo into high gear. On to the next thing!!! Jellybean is now officially three. We had a blowout family bash that was totally spooky and Halloween themed. Literally my kid has not stopped talking about Halloween since last Halloween so we just kinda leaned into the theme for his birthday. Well birthday party meant quality grandparent time which then correlates into mommy free time. 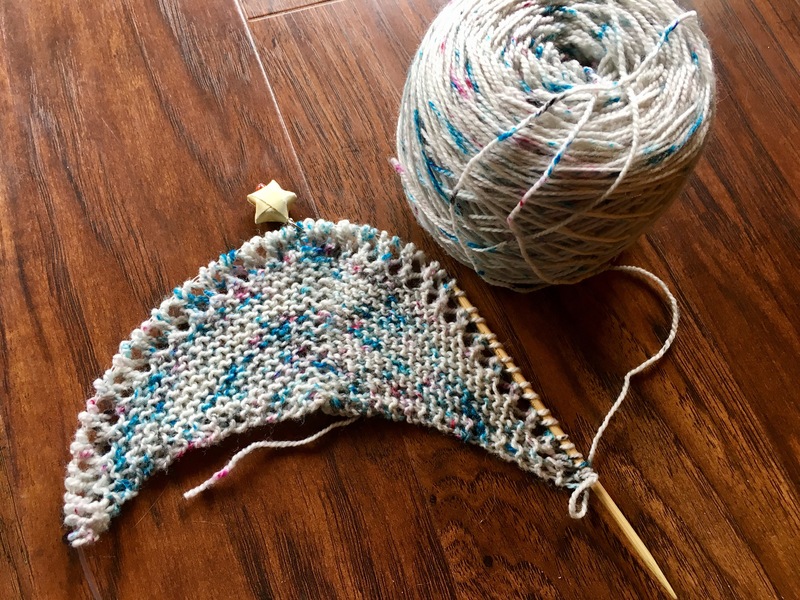 I had been thinking more and more about the Daunt Cowl. The only thing holding me back was the lack of a good neutral in my stash. All my sock stash is highly variegated or self-striping. 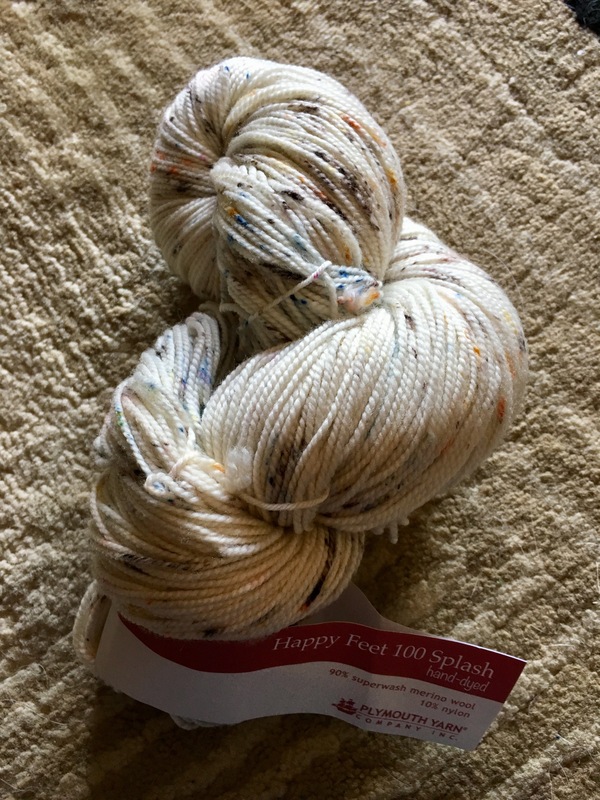 So I tip-toed over to my LYS and found a neutral sock yarn…..Plymouth Yarn Happy Feet 100 Splash in the Autumn color…. So while Jellybean was showing Papa around the local Zoo…I culled my sock scraps and found a rainbow’s worth. That’s 24 minis that go from grey/pink through the rainbow and back to grey. I made a pattern page here and you can see what my scraps are. I painstakingly weighed and wound according to the directions and look what beauty I got! Isn’t this about the best thing you have ever seen? My ball winder JUST barely was able to wind this bad-boy. It’s over 1,000 yards because some of my scraps were over the 5 gram suggested allotment. 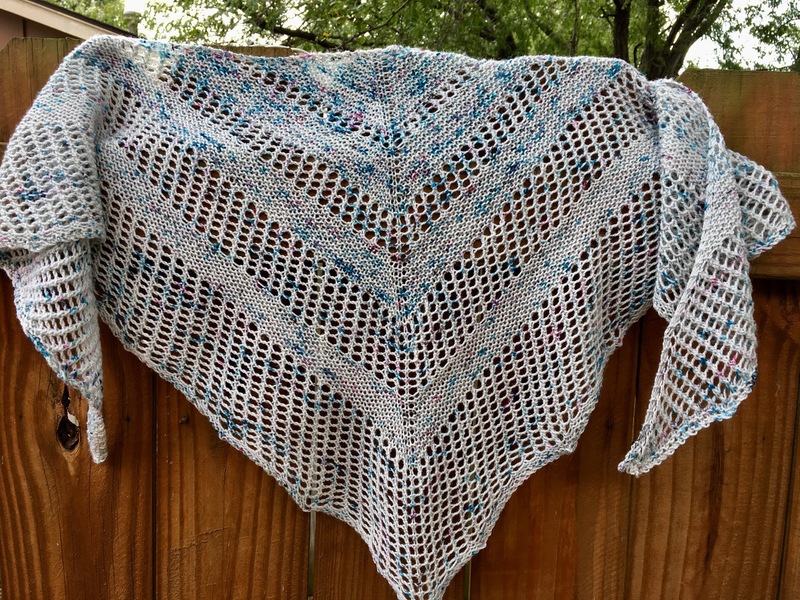 I wanted to use up as much as possible plus this now counts as a Blitz project for the #pigskinparty17 KAL! It’s confession time….I’m ADDICTED to this project. My Reyna is now over halfway done! I literally wake up in the middle of the night and seriously consider knitting on this project. I’ve been knitting during meetings, over my lunch, every spare minute I’m not in charge of Jellybean. The pattern is just so intuitive and the fact that the pattern has neat little boxes to tick off your row progress is heaven. I just can’t wait to cross off more squares! I haven’t knit a stitch on anything else since I cast this on. And *knock on wood* I haven’t made any serious mistakes that I couldn’t fix. All my eyelets are lining up and my center spine is straight! I’m hoping that maybe, just maybe I can finish this by Friday…..we’ll see! 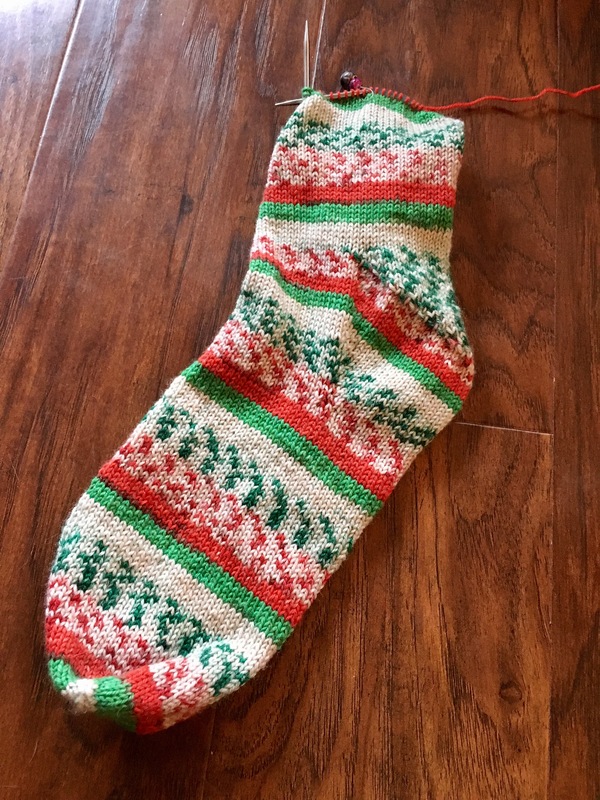 With some personal perseverance and some Knitflixing, I finished the leg of the first sock for my Mom’s Christmas Socks! I am using size 2 needles and my mom wears a size 8/8.5 US women’s shoe. I cast on and worked 66 stitches for the foot to get the circumference where I needed it. Right before the heel I decreased away two stitches to get the count to 64 to make the heel turn work. And then after the heel I went back to 66 stitches for the leg. And finally before the cuff I increased up to 68 stitches for both roominess and to make by 2×2 rib work. I’m just so please with this sock! 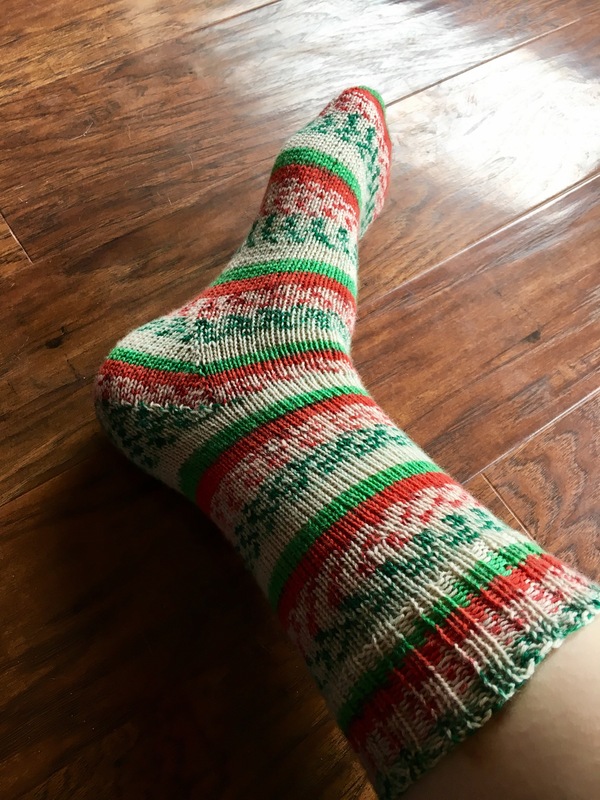 I managed the whole sock in roughly a week and a week that involved a lot of sleep deprivation! The sock fits me nicely as well. I’m a size longer than my mother but my foot is not a wide. So I feel like the fabric is very forgiving will conform to the foot very well. Now I just need to make sure I cast on the second sock and get a cooking. 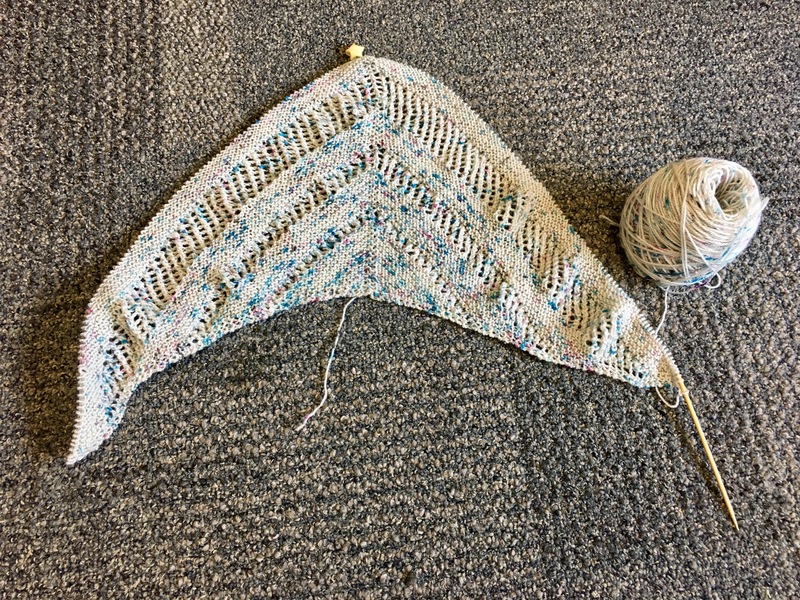 I’m hoping to get this finished so I can enter into the 12monthstoXmas KAL, the Pigskin Party KAL, and possibly the Double Dip KAL by the Bede Sisters Podcast. As I mentioned before the hubby took Jellybean for the weekend this past weekend and I was FREE! I also happened to have a weekend get-together with some coworkers at a local vineyard winery. My coworkers know I’m weird and if they didn’t know….they do now! I took my Mom’s Christmas Socks with me because I had just literally turned the heel the night before. You guys….I got almost four inches of leg done despite partaking in Wine Slushes and generous sampling! It was just so amazingly soul restoring to laugh, knit and just enjoy the company of others. I definitely don’t do that enough! My coworkers were so gobsmacked that I could knit without looking. And they thought I was counting and manually making the pattern appear. (I did break that illusion by showing them the yarn ball but they were still duly impressed.) 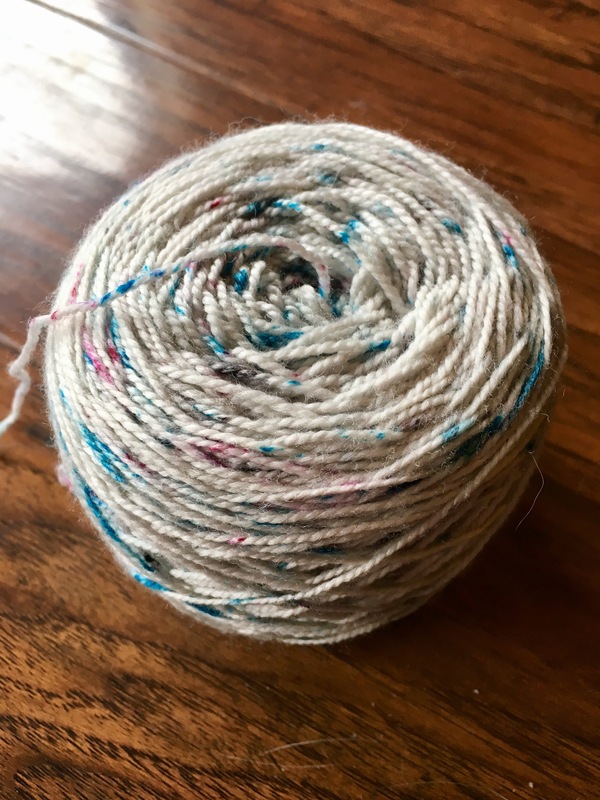 These print yarns from Cascade Heritage are just my favorite go-to gift knit yarns. 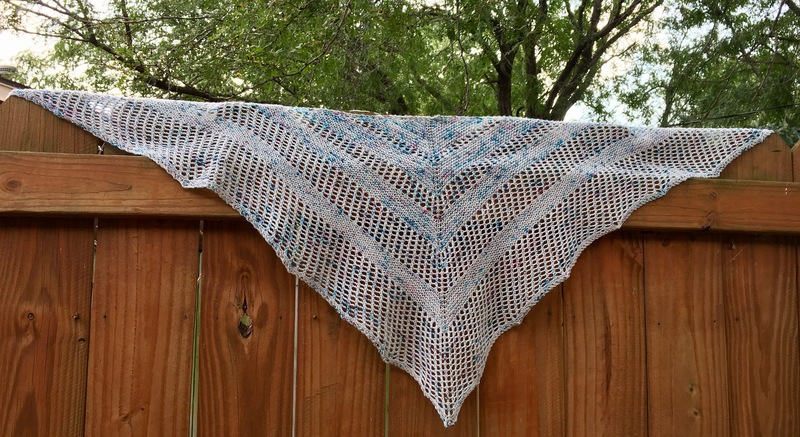 The patterns are amazing, the fabric is pleasing and they are easy care for non-knitters! I hoping to knock out the rest of the leg and cuff this week. Stay tuned! But I digress, I had almost the whole weekend! Jellybean got me up multiple times between 4 and 7 am the night before so I decided to be industrious after they hit the road. 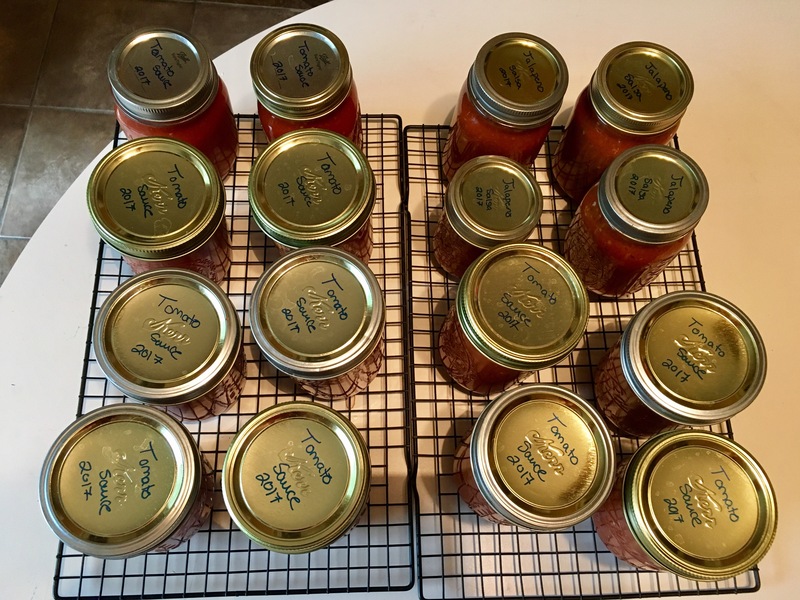 I pulled seven or eight gallon bags of tomatoes frozen from our summer garden and started simmering tomato sauce. This is most the ingenious thing my grandma taught me. Since my tomatoes didn’t set enough at one time to make batches of sauce we freeze them in bags after being washed and de-stemmed. When you pull them out and dunk them in warm water the skins slough right off and the flesh can go right into the cook pot. There is no blanching or peeling….its amaze-balls! It was hot and messy but in the end I made 3 1/2 pints of super hot jalapeno salsa for the hubby. And then 12 pints of plain tomato sauce for cooking. I’m sooo happy to be filling my pantry with these goodies for a fresh pick me up mid-winter! I did a fair bit of knitting as well while the sauce was simmering. I’ll show you that later this week….stay tuned! 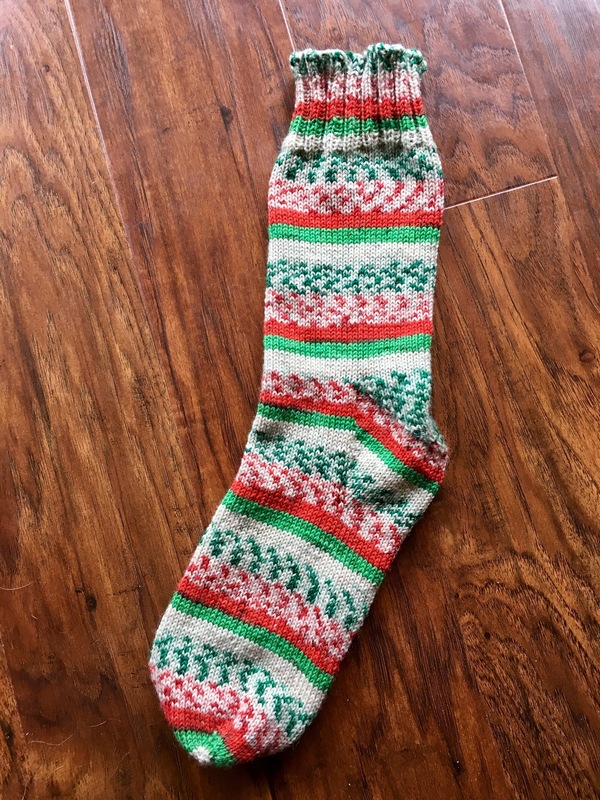 During a recent visit to my parents, my Aunt Barb pulled me aside and said that my mom was bummed that she was the only one in our immediate family who hadn’t received any hand knit socks. Well, what knitter can resist the sirens call of that kind of request! 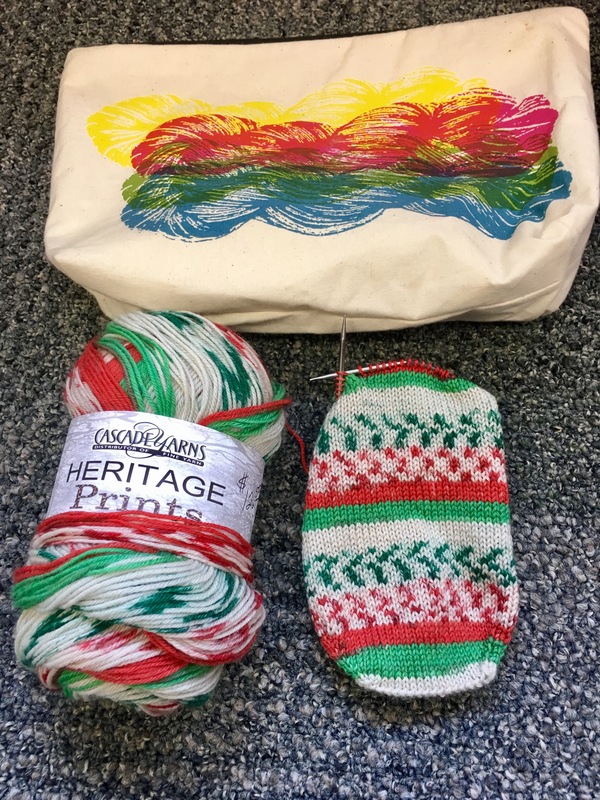 I pulled some Cascade Heritage Prints in the Christmas colorway from my stash and some size 2 needles and immediately cast on. Now she is roughly a size 7/7.5 US women’s shoe. So I’m pretty certain I’m going to work a 64 stitch sock but I’m not sure how much length she needs. I kind of want this to be a Christmas surprise so I need to find a way to steal a peak at her favorite shoes…. Earlier this week I showed you my cast on for some Knitted Knockers. 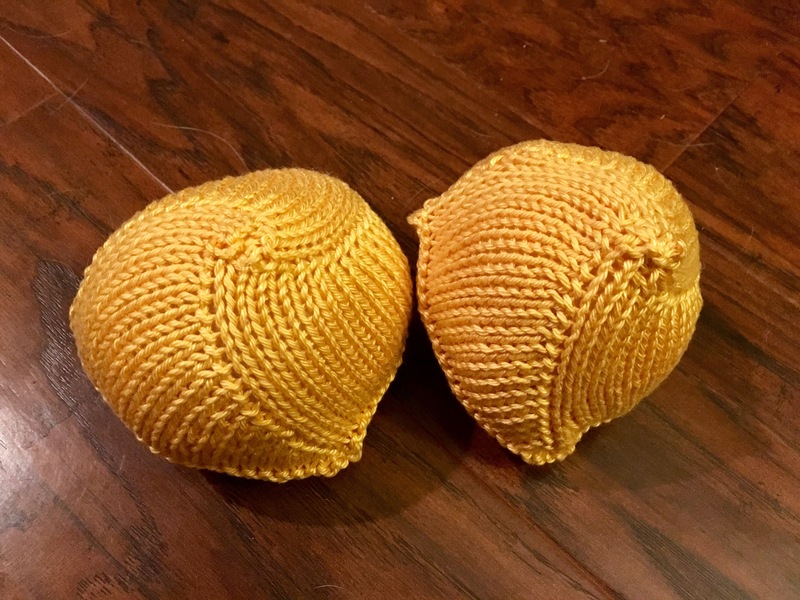 I literally finished the first set of A-cups in two evenings. They turned out pretty good if I do say so myself. The second one was much improved from the first as I remembered all the tricks to working in the round on double pointed needles. I used the approved Cascade Ultra Pima in yellow. 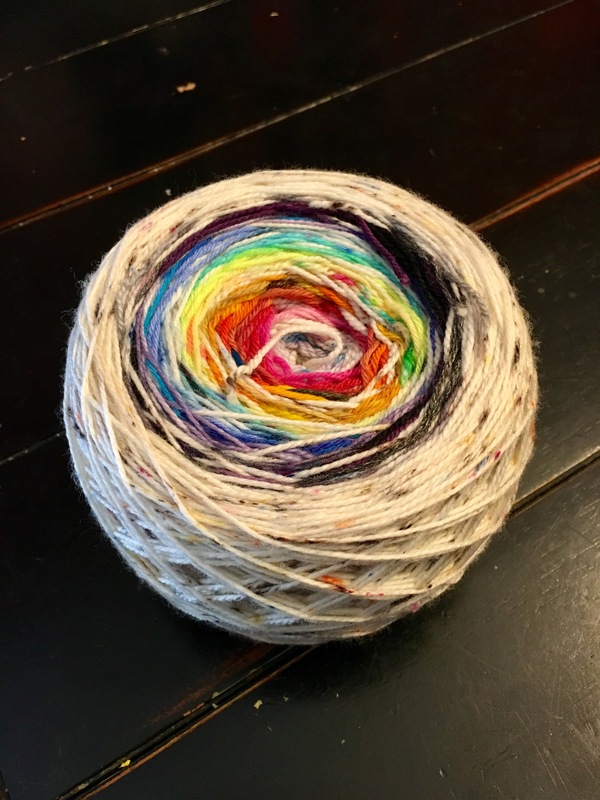 The a-cup used 25 grams or roughly 55 yards of yarn. And I measured out the stuffing to make them evening filled. 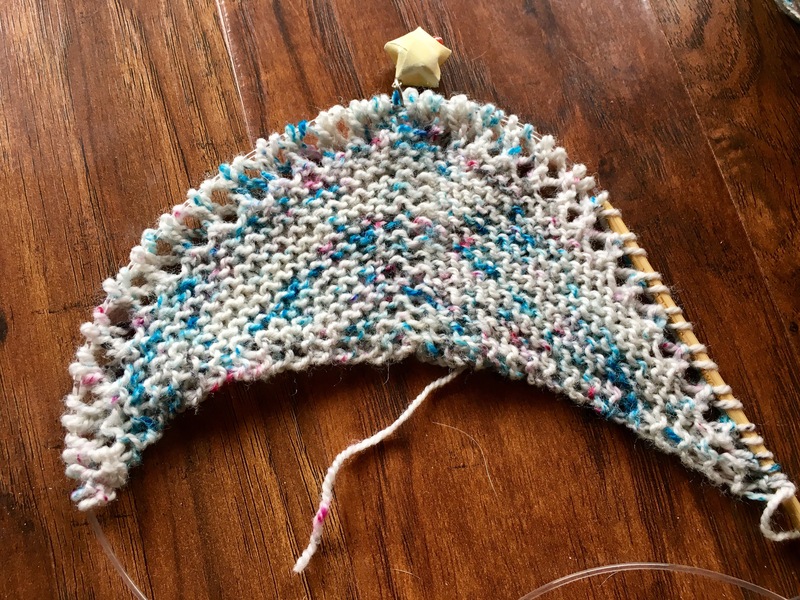 The trickiest party is getting those first few rounds done where you don’t have many stitches on the needles and it’s easy to twist. I was so enamored that I cast on and finished a second pair! 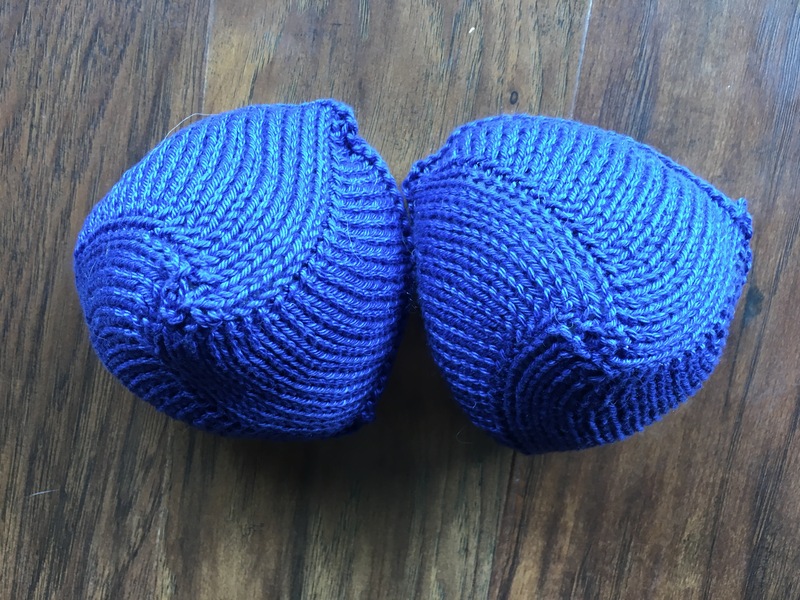 This time I made B-cups in royal blue. These two based on the weight of the un-stuffed items used 25 grams or 55-56 yards of Cascade Ultra Pima in royal blue. The best part is that each knockers counts as a finished object for the KAL. They each earn me 3 points for yardage, 4 points for charity and 4 points for using my team colors. So in just a couple of evenings I scored 22 points!